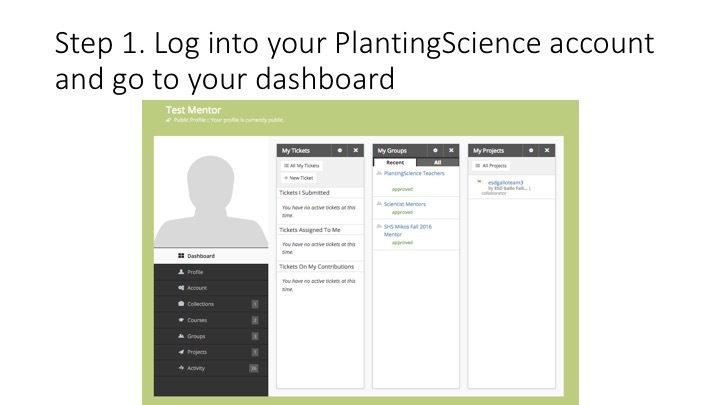 For those who are new to PlantingScience, we have created a set of instructions to answer some of the most frequently asked questions regarding using the website. 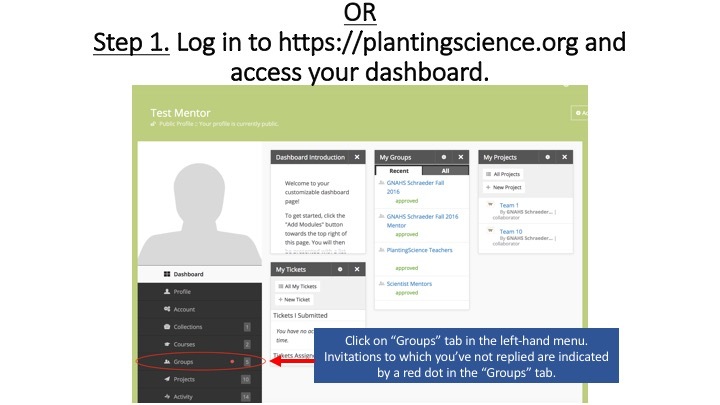 If you cannot find the answer to your question on this page, you can submit a ticket to the PlantingScience team, and we will respond as quickly as possible. How do I set my profile to "Available"? 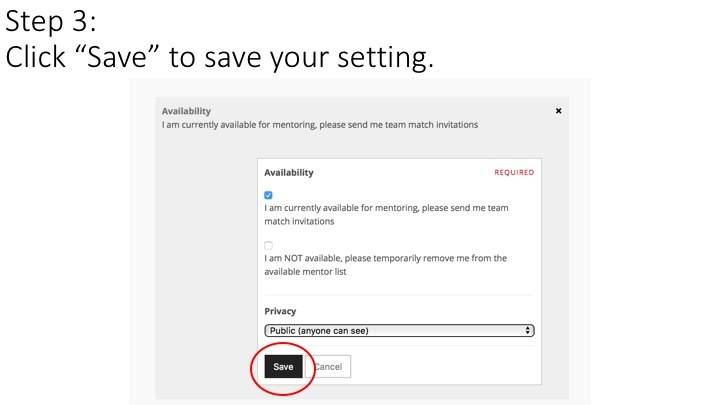 Please be sure to set your profile to "Available" if you plan to mentor for the current session. 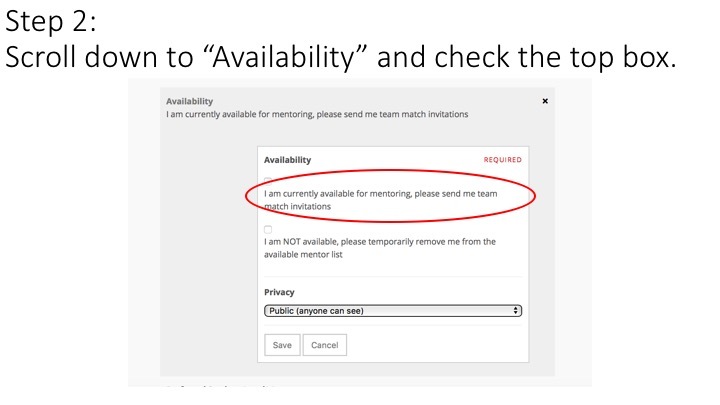 If, however, you would prefer NOT to mentor until another session, please be sure to mark your profile as "Unavailable." We cannot guarantee that you will not get invitations, but it should reduce the number of invitations prior to and during the current session. 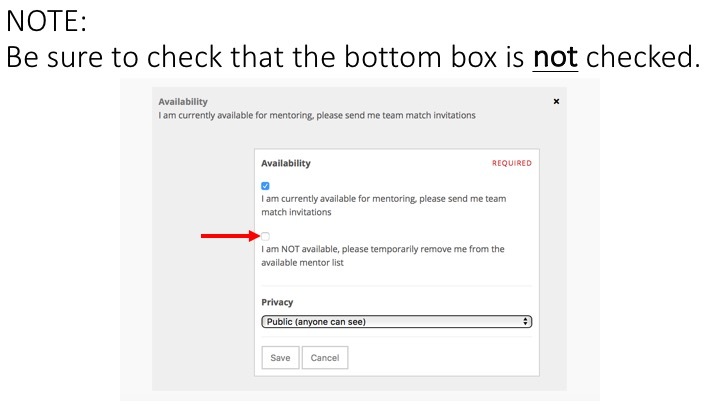 How does mentor matching work? Liaisons and teachers are reviewing your profile to determine whether you would be a good fit for the classroom's investigation themes and goals. 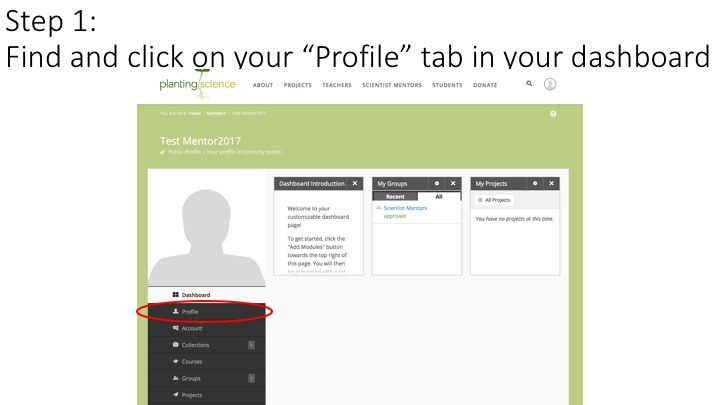 Be sure to complete your profile, mark it as available, and make sure that you select enough investigation themes that you would be comfortable to mentor. This would increase the likelihood of being selected as a mentor. How do I see invitations and accept or decline them? 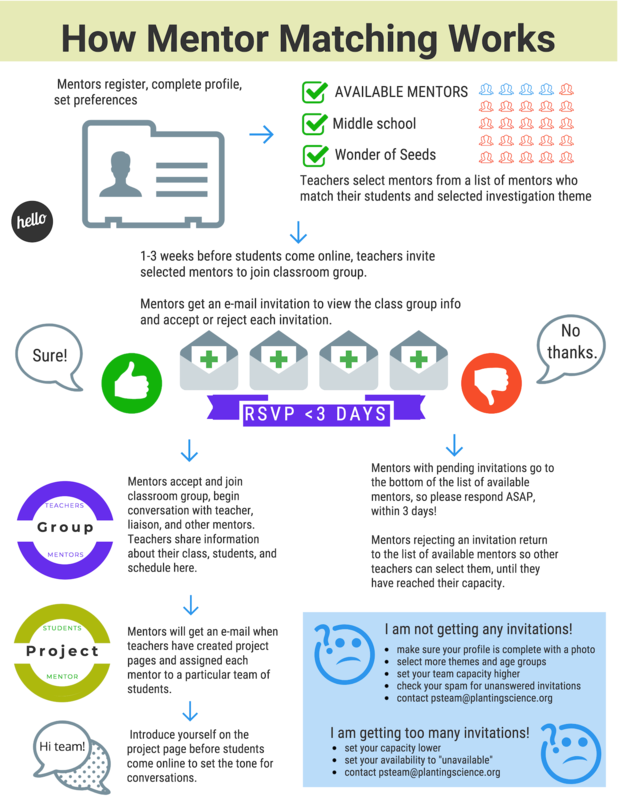 Teachers and liaisons will invite mentors to join their classroom's group, and mentors should receive an invitation via email to join the group. 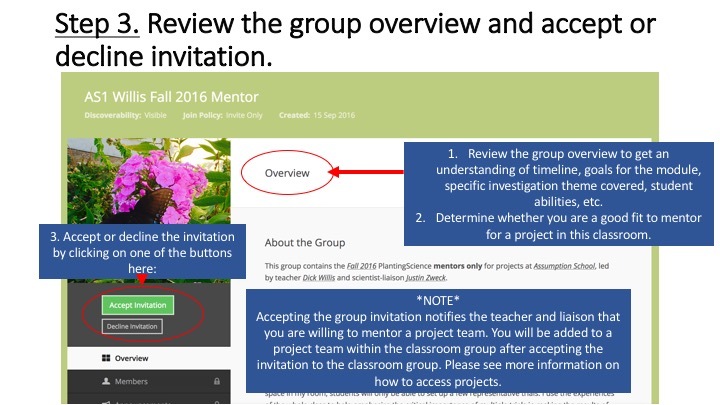 Mentors should review the group overview to determine whether s/he would be a good fit for one of the teams in the classroom; there, mentors will have the option to accept or decline the invitation. Upon accepting this invitation, mentors have agreed to be added to a project team within that group to mentor a team of students. 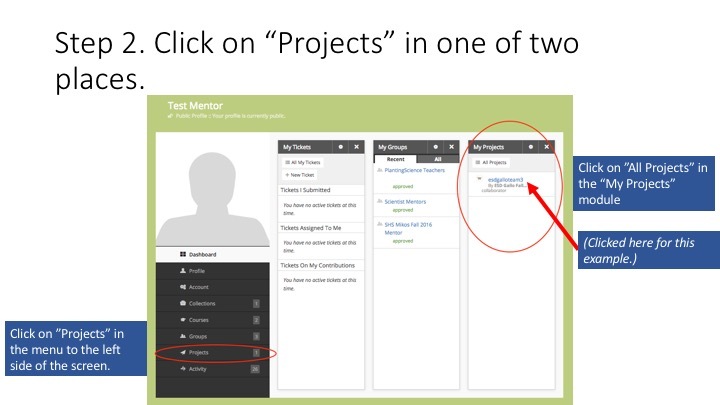 Teachers or liaisons will then add mentors to project teams. 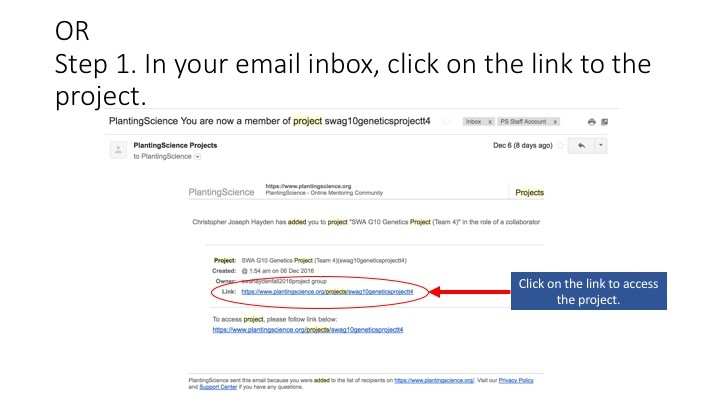 Mentors should receive an email once they have been added to a project team. 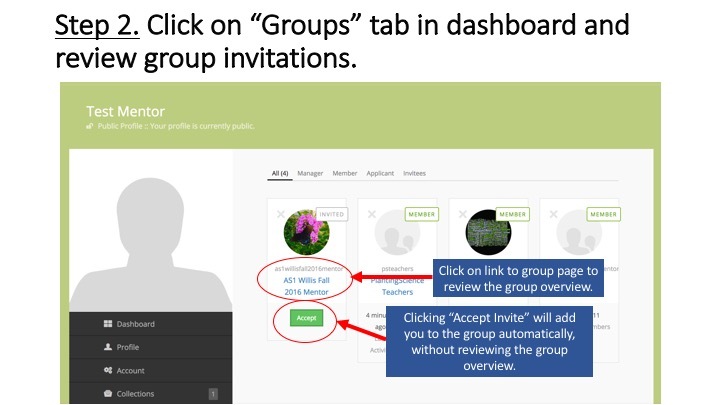 Once you have accepted an invitation to a group, you will be added to a project by the teacher or the liaison for the classroom. I haven't been invited to mentor yet. What can I do to expedite this process? Remember to review your invitations and respond to them within 3 days! What are "Investigation Themes"? Do I need to know anything about them? 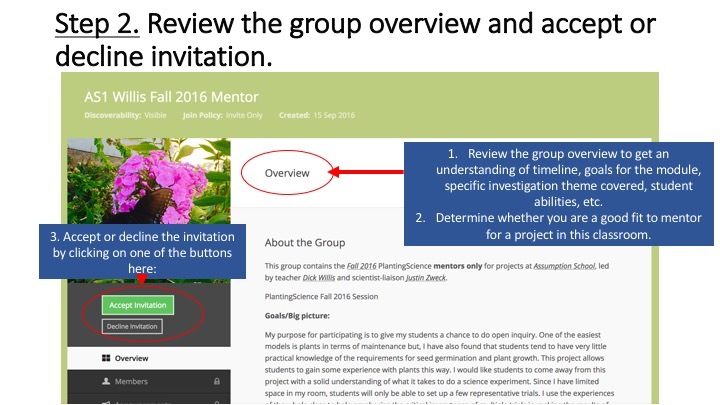 Teachers who participate in PlantingScience select an Investigation Theme for his/her class to follow. The topics range from agronomy to photosynthesis to genetics and more. Please take a few moments to review the Teacher's Guides or Mentor Tip Sheets for these themes to get a sense for what students will be doing in the classrooms. You can then update your profile to indicate for which theme(s) you are willing to mentor. My team hasn't posted in a few days or more. What do I do? How do I communicate with my student teams? 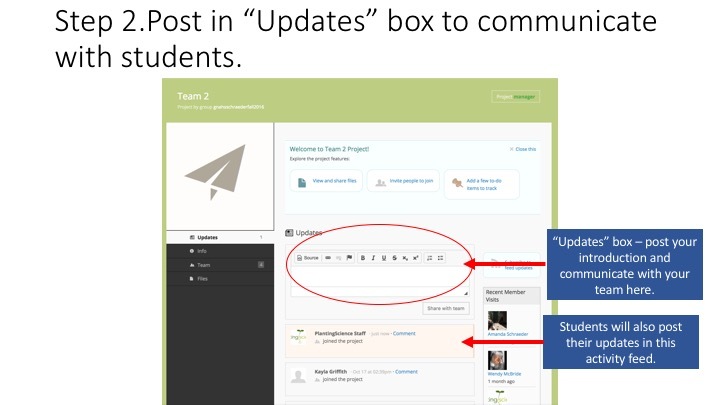 How quickly do I need to respond to group invitations or student posts? 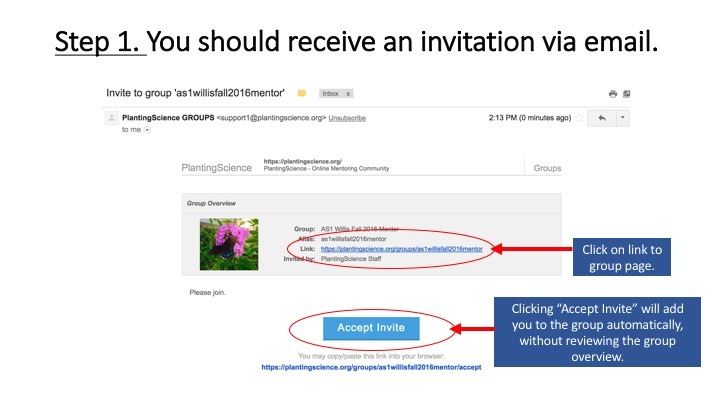 Responses to invitations: Please accept or decline the invitation to a group within 3 days. Maybe times, teachers are ready to get started by the time they or their liaisons send invitations to mentors, so please do try to respond quickly. Of course, do take the time to review the group overview to determine whether it is a good fit for you. 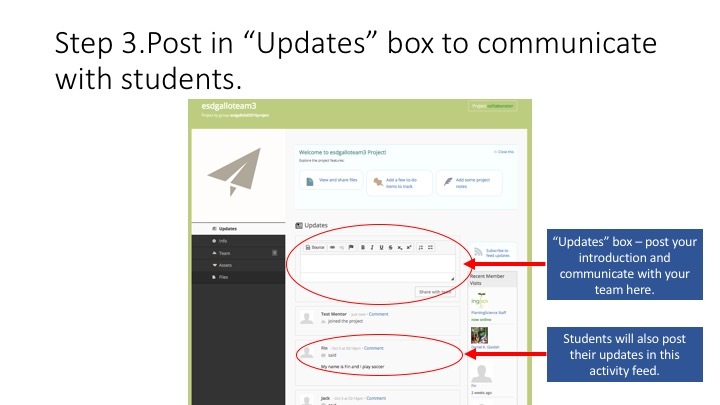 Responses to student posts: Please respond to students as quickly as you can - ideally within a 24-hr period. Keep in mind that students are comparing mentor responses and response times in the classroom, so students with mentors who consistently take more than 24 hours to respond will often lose interest and motivation, especially if their peers' mentors are very active and responsive. What do I include in a typical post to students? then wrap up the post with a couple of closing words. For other posts to your students, they may be as simple as “your experimental design looks great! I’m looking forward to seeing how it works!” or as complex as explaining how statistics work during data analysis. It all depends on what your students need and what the goals of the teacher are. The important thing is to always be encouraging and help the students work around issues within their experiments just as much as you celebrate their successes with them. You should also regularly add probing questions to your posts, you want to encourage the students to think about their topics, hypotheses, and the meaning of their results. One particularly tough time is when your team does not get great results. It is easier for experienced scientists to understand that failure is part of the scientific process, but this may be the first experiment your students have ever designed, and failure may not make as much sense to them. It is important to let your students know that it is okay if they did not get the result they hoped for and to ask them questions about what they think drove them to get those results or what they might do differently next time. Another thing you could do to help lead the students to sources for them to explore some of the reasons they may have gotten the result they did. See the example below for help! I've been asked to video conference with a class - what do I do? Whether a teacher requests 1 or 2 video conference calls, talking "face-to-face" provides an excellent opportunity for students and mentors. Video conferences are really helpful for a number of reasons. One is simply that the students get to see you! 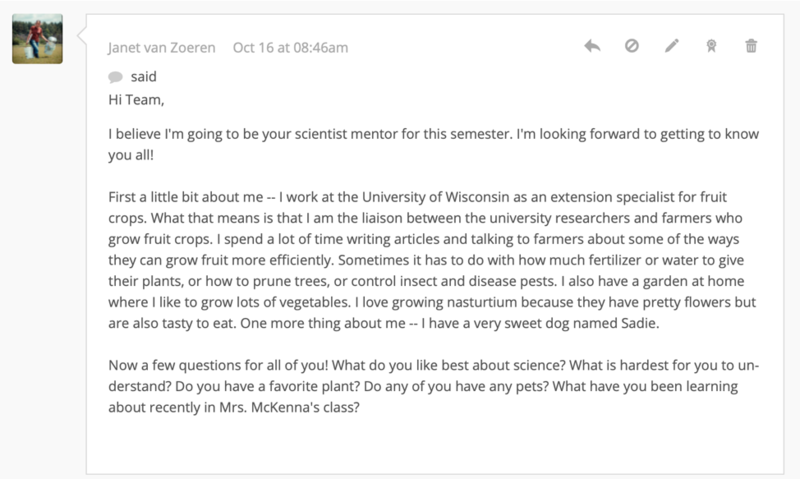 Posting on the PlantingScience platform is an excellent way to introduce students to scientists, but when students talk with you directly while they can see you, there's more of a connection. The students will immediately see you as a person, rather than just a scientist. They get to know your humor and personality, and that can make all the difference to students. Especially those who are interested in pursuing science as a career. It can also encourage students to put more effort into their project, because they know you now and what you expect from them. Talking directly in real time also gives the students the opportunity to explain their projects more clearly than they may be able to in writing at the beginning of the challenge. Similarly, it gives you the opportunity to explain more complex topics to the students that may help them through their project. The teacher with whom you are working will likely decide what platform to use (e.g. Google Hangout, Skype, Zoom, etc.) and set up a time during their class for a call. You must go through the teacher for all video conferencing. DO NOT video conference with the students directly. Before starting your video conference, consider the purpose of the video conference (again, the teacher will likely give you a heads up on this): What questions do you have to ask them? Maybe you could even ask to see their experimental setup! Don't worry if you don't get to all your topics; it's just good to have in case the conversation lulls. Also, frequently, the teachers will have already asked the students to make outlines with questions for you as well! Logistics and Setup - Do you have a good internet connection? Make sure the area you're in has a good internet connection. The point of a video conference is for the students to see you! So, if your wifi connection is bad and you have to turn off the camera, it's a little less fun for the students. 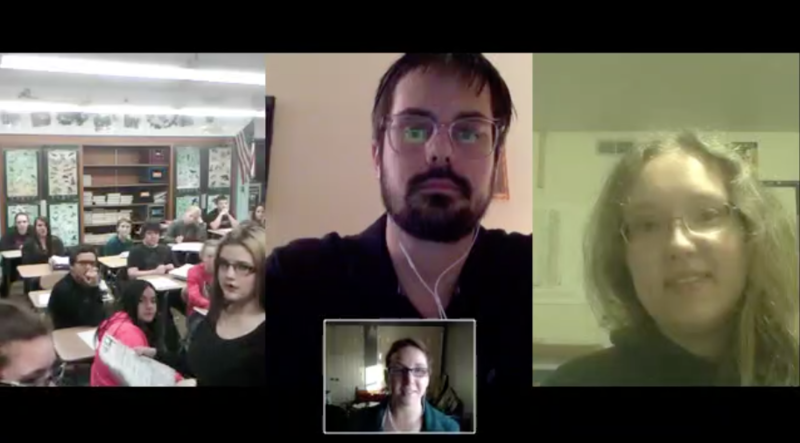 To ensure your students get the most out of your video call, make sure your lighting is good. Sitting at a table with a window behind you hides your face in the shadow, and then the students won't be able to see you. Sit with the window or light in front of you so that it's shining on your beautiful face! Also, be aware of your surroundings when video conferencing. Don't start a conference when you're in a loud, crowded public area. That can be distracting for the students. Similarly, don't eat while in a video conference. It's distracting, and you shouldn't talk with your mouth full. Also, be aware of anything that might be behind you like books or art. Make sure nothing is obscene or controversial. When in the video conference, be careful of what you say. DO NOT curse or talk about anything too controversial. If the students start questions that are too personal, do not feel obligated to answer them. Simply steer students back into talking about the topics on your outline or ask them a question about their project instead. Most importantly, BE YOURSELF! For the majority of students, this will be the FIRST time they speak with a real, live scientist! Many students are surprised that scientists are not what they appear to be on T.V., so just seeing and hearing you might motivate a new crop of plant scientists! Finally, to end your video conference, be sure to thank the students for being on task and being great scientists in training! Tell them what they've done well and give them something to work on for your next meeting. 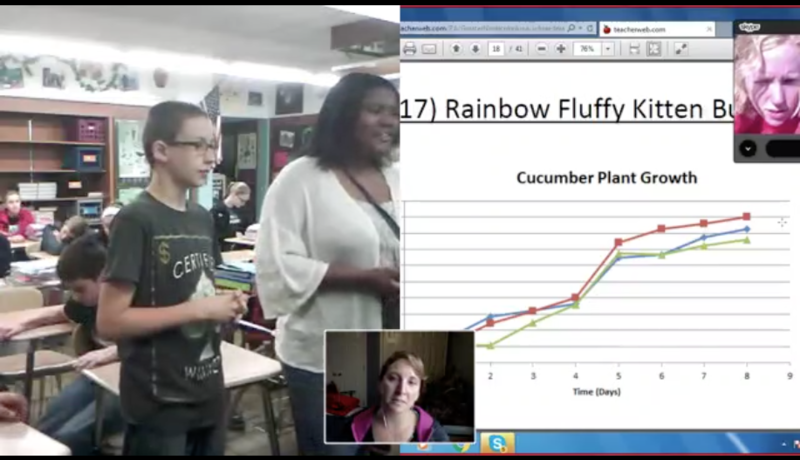 Making a goal for your next video conference is really important because you want to make sure the students are working towards finishing their experiment. Uh, oh - I've run into an issue. What do I do? There may be times when, as a mentor, you might encounter an error, and you are not sure whom to ask about it. We have created a quick reference table for you that covers the most common issues mentors see. How do I submit tickets with questions about the website? Click on the "?" in the upper right corner of just about any page and follow the prompts to submit your question (see image below). Be sure to include screenshots of error messages with a description of what you were trying to do. Tickets can be used to report bugs or ask for support using the platform. How do I contact PlantingScience staff?